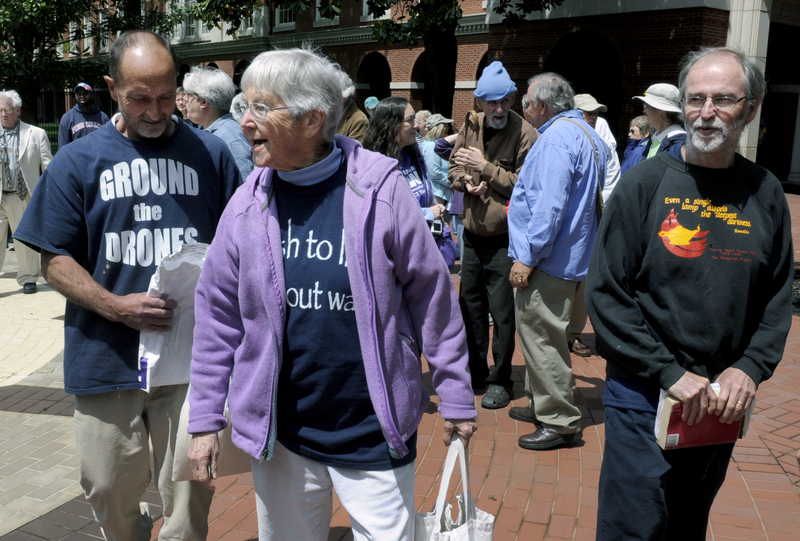 KNOXVILLE, Tenn. An 83-year-old nun and two fellow protesters were convicted Wednesday of interfering with national security when they broke into a nuclear weapons facility in Tennessee and defaced a uranium processing plant. It took a jury about 2-and-a-half hours to find the three protesters guilty of a charge of sabotaging the plant and second charge of damaging federal property in July the Y-12 National Security Complex in Oak Ridge in July. Defense attorneys said in closing arguments that federal prosecutors had overreached in the charges because of the embarrassment caused by the break-in. "The shortcomings in security at one of the most dangerous places on the planet have embarrassed a lot of people," defense lawyer Francis Lloyd said. "You're looking at three scapegoats behind me." Defense attorney Bill Quigley urged jurors to "protect all of us from the government gone overboard," he said. "Sometimes they overreach." Prosecutor Jeff Theodore was dismissive of claims that the protesters' actions were beneficial to security. "Right after 9/11, did you notice how much better security got at airports and public buildings?" Theodore said. "Does that mean 9/11 was a good thing? Of course not." Theodore said the protesters' intent was made clear by the fact that they carried the materials with them to deface the building they targeted. He also noted that their fate could have been far worse than ending up in court because they had entered an area where guards were allowed to use deadly force. "They're lucky, and thank goodness they're alive, because they went into the lethal zone," he said. The defense asked for a mistrial over the Sept. 11 comparison, but the judge denied the motion. Earlier Wednesday, Sister Megan Rice, Michael Walli and Greg Boertje-Obed testified on their own behalf, saying they have no remorse for their actions and were pleased to reach one of the most secure parts of the facility. The defendants spent two hours inside Y-12. They cut through security fences, hung banners, strung crime-scene tape and hammered off a small chunk of the fortress-like Highly Enriched Uranium Materials Facility, or HEUMF, inside the most secure part of complex. Rice said during cross examination that she wished she hadn't waited so long to stage a protest inside the plant. "My regret was I waited 70 years," she said. "It is manufacturing that which can only cause death." Boertje-Obed, a house painter from Duluth, Minn., explained why they sprayed baby bottles full of human blood on the exterior of the facility. "The reason for the baby bottles was to represent that the blood of children is spilled by these weapons," he said. All three defendants said they felt guided by divine forces in finding their way through the darkness from the perimeter of the complex to the enriched uranium plant without being detected. "I believe it was clearly a miracle," Boertje-Obed said. "There is no other way to explain it." Walli, who said he has been homeless in 10 states and has most recently lived in Washington, D.C., agreed. "It was an answer to prayer," he said. The protesters' attorneys noted that once they refused to plead guilty to trespassing, prosecutors substituted that charge with a sabotage count that increased the maximum prison term from one year to 20 years. The argued during the trial that the more serious charge should be dismissed. Prosecutors argue the act was a serious security breach that continues to disrupt operations at the facility. The intrusion caused the plant to shut down for two weeks as security forces were re-trained and contractors were replaced. Federal officials have said there was never any danger of the protesters reaching materials that could be detonated on site or used to assemble a dirty bomb, a position stressed by defense attorneys. The plant that has had a hand in making, maintaining or dismantling parts of every nuclear weapon in the country's arsenal. The protesters call themselves "Transform Now Plowshares," a reference to the biblical phrase: "They shall beat their swords into plowshares, and their spears into pruning hooks." Their actions were lauded by some members of Congress, who said the incursion called attention to flawed security at Y-12, first built as part of the Manhattan Project during World War II that provided enriched uranium for the atomic bomb dropped on Hiroshima, Japan. The plant makes uranium parts for nuclear warheads, dismantles old weapons and is the nation's primary storehouse for bomb-grade uranium. The facility enjoys high levels of support in the region, and Oak Ridge has always taken pride in its role in building the atomic bomb, viewing it as crucial to the end of the war. A report by the Department of Energy's inspector general said Y-12 security failures included broken detection equipment, poor response from security guards and insufficient federal oversight of private contractors running the complex. For decades, protesters have rallied at the gates of Y-12 around the anniversary of the bombing of Hiroshima. Some deliberately trespass or block traffic to provoke arrest and call more attention to their cause. Some years, authorities have tried to deprive them of the notoriety by refusing to prosecute. In previous prosecutions, the stiffest sentence ever meted out was less than a year in prison.